It is the Cosmic Era of 73. The Naturals and the Coordinators were on the verge of signing a peace treaty to end the war. But everything went wrong in this series of Gundam Seed Destiny, as Shinn Asuka and Athrun Zara of pilot their mobile suits to face a new threat of incoming forces. 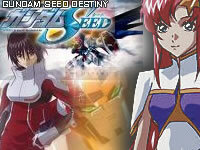 With a new wave of mobile suits, Gundam Seed Destiny takes the viewer to a new level of space action!